Pew Research Center technology surveys (such as those that form the basis of Chapters 1 and 2 of this report) typically ask respondents whether they use various devices or online platforms, the ways in which they incorporate those tools and platforms into their lives, and the impact of those technologies on their attitudes and experiences. These traditional survey methodologies can help provide a broad view of the use and impact of technology among the American public. But survey respondents often have trouble remembering and providing precise details of their day-to-day lives — such as the number of times they have taken a particular action in the course of a week. 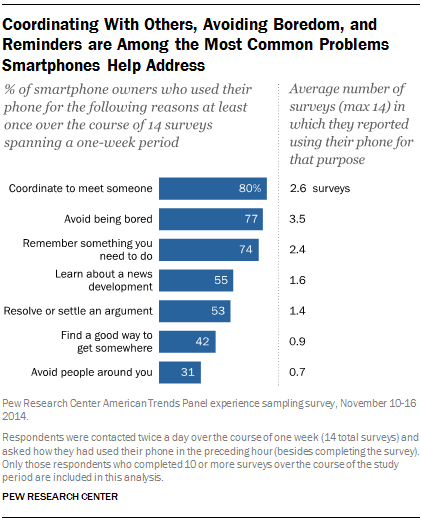 In an effort to gain a more fine-grained view into the ways that smartphone owners use their devices on a daily basis, Pew Research conducted a week-long survey of smartphone owners. In this survey, respondents were contacted on multiple occasions (by email, text message, and/or via an app installed on the respondent’s phone) and asked a short series of questions about how they had used their phone in the hour prior to taking the survey. This type of survey, in which respondents are asked about their experiences or behaviors at specific times over the course of the study period, is known as an “experience sampling” survey. Which behaviors and experiences are the most widespread within the smartphone owner population (that is, which ones are used or experienced by the largest subset of users over the course of a typical week). 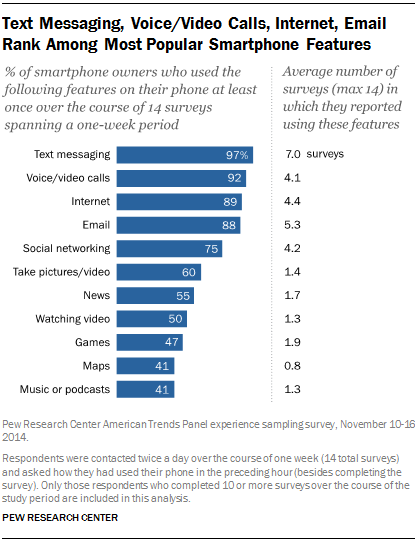 Which behaviors and experiences are the most frequently used among smartphone owners (that is, which ones occur with the greatest regularity throughout the course of the week). Details of the study, and the findings from this week-long survey of smartphone users, are discussed in more detail below. Participants in the experience sampling study were recruited from the 2,188 smartphone owners who responded to the American Trends Panel survey that forms the basis of Chapters 1 and 2 of this report. Upon completion of the main survey, these respondents were asked if they would be willing to take part in a follow-up study, in which they would complete a series of short surveys about their smartphone use over a period of one week. Respondents who agreed to take part in the follow-up study were contacted twice a day for a period of seven days. Each time, they were asked a short series of questions about how they had used their smartphone in the hour prior to taking the survey. Specifically, they were asked to indicate the features or apps they had used on their phone; the locations where they had used their phone; the issues or problems they had used their phone to solve; and the emotions they felt as a result of having their phone with them. For a more detailed description of the study methodology, please see the Study Methods section of this report. The first question in the survey asked respondents to indicate which apps and features they had used on their phone in the preceding hour, apart from answering the survey. These findings indicate that certain features are used nearly universally and relatively frequently among a diverse range of smartphone owners, including text messaging, voice and video calls, internet use, and email. Other features are extremely popular among certain groups of users but less widely-used among others. For example, social media, listening to music, and watching video are all extremely common among younger smartphone owners but less common among older age groups. A third category of features are less prevalent overall but appeal to a relatively wide cross-section of users, such as gaming and news consumption. Four smartphone features — text messaging, voice and video calling, using email, and using the internet — stand out as the most widely used out of the eleven apps and features evaluated in this study. Nearly all of the smartphone owners surveyed (97%) used text messaging at least once over the course of the study period. Text messaging is followed closely in popularity by voice calling (engaged in by 92% of smartphone owners), using the internet (89%), and using email (88%). In addition to being the most widely-used smartphone feature, text messaging is also the most frequently-used. These smartphone owners reported using text messaging in the past hour in an average of 7 different surveys over the course of the study period (out of a maximum of 14). By comparison, they reported using email in an average of 5.3 surveys, internet use in an average of 4.4 surveys, and voice/video calling in an average of 4.1 surveys. These smartphone features are also popular with users from a wide range of age groups. For example, 100% of 18-29 year old smartphone owners used text messaging at least once over the course of the study,6 but so did 92% of those 50 and older. 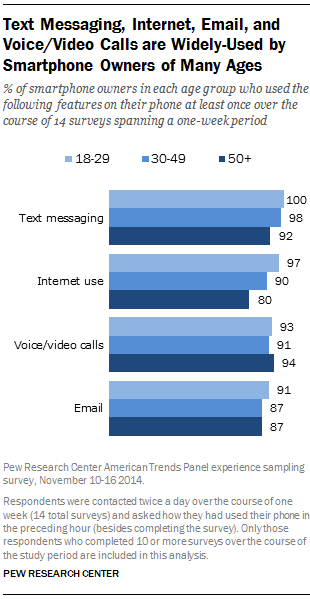 These age-related differences are even more modest for email (91% of 18-29 year olds and 87% of those 50 and older used email at least once) and voice/video calling (93% of 18-29 year olds did this, as did 93% of those 50 and older). Internet use, though quite common among older adults, is near-ubiquitous among younger users — fully 97% of 18-29 year old smartphone owners used their phone to go online at least once during the study period, compared to 80% of those 50 and older. Pew Research surveys of teens and technology have found that voice calling and text messaging go hand in hand, and this correlation also holds true for the adult population: Put simply, adults who do more text messaging tend to do more voice calling as well. Smartphone owners who use text messaging relatively infrequently (defined as reporting text messaging use in 1-5 surveys over the course of this study period) reported making voice calls in an average of 2.6 surveys; those who use text messaging moderately frequently (in 6-10 surveys) reported making voice calls in an average of 4.3 surveys; and those who use text messaging very frequently (in 11 or more surveys) reported making voice calls in an average of 6.4 surveys. Similarly, young adults use text messaging more frequently than older adults—but do not exhibit corresponding lower rates of voice calling. Smartphones owners ages 18-29 reported using text messaging in nearly two more surveys over the course of the study period compared with those ages 50 and older—young adults reported using text messaging in an average of 7.8 surveys, while those 50 and older did so in an average of 6 surveys. But despite these fairly pronounced differences in text messaging frequency, rates of voice calling for older and younger smartphone owners are nearly identical: young adults reported using voice calling in an average of 3.9 surveys over the course of the study, while those age 50 and older did so in an average of 4.2 surveys. Activities such as social networking, watching video, and listening to music or podcasts vary substantially in terms of their overall popularity. At the high end, 75% of smartphone owners indicated using social networking on their phone in the previous hour at least once during the study period, while on the low end 41% used their phone at least once to listen to music or podcasts. But although they differ in terms of their overall usage rates, they share the common characteristic of having especially high rates of engagement among younger smartphone owners. 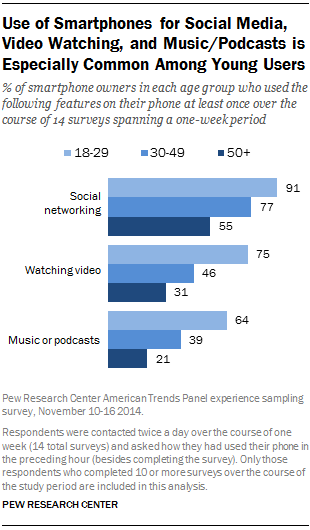 Young smartphone owners are particularly avid participants in social media activities. Fully 91% of smartphone owners ages 18-29 used social networking on their phone at least once over the course of the study period, compared with 55% of those 50 and older (a 36-point difference). These young smartphone owners reported using social networking on their phone in the prior hour in an average of 5.6 surveys, which is tied with internet use as the second-most frequent smartphone behavior among young adults. These differences between older and younger smartphone owners are even more pronounced when it comes to watching videos and listening to music or podcasts. Three-quarters of younger smartphone owners (75%) used their phone to watch a video at least once over the study period, compared with 31% of those 50 and older (a difference of 44 percentage points). And 64% of younger adults used their phone at one time or another to listen to music or podcasts—a 43-point difference compared with the 21% of older users who did so. The remaining apps and activities (news, games, maps and navigation, and taking pictures or video) occupy a middle ground between the two groups discussed above. They are not as widely used as activities like text messaging or voice calling—but they also exhibit more modest differences across age groups compared with activities like social networking. Of this group of activities, picture-taking and news consumption are the most common: 60% of smartphone owners used their phones for taking pictures or video at least once over the course of the study period, and 55% used their phone for news over the same time period. Games and maps/traffic are slightly less common: 47% and 41% of smartphone owners, respectively, used their phone for these purposes at least once in the course of the study period. Each of these behaviors is more prevalent among younger smartphone owners than among older users, although these differences are generally modest in comparison with activities like social networking. There is a 16-point gap between those ages 18-29 and those 50 and older when it comes to using one’s phone for games; a 13-point gap for taking pictures and video; an 11-point gap for using maps and navigation; and an 8-point gap for getting news. 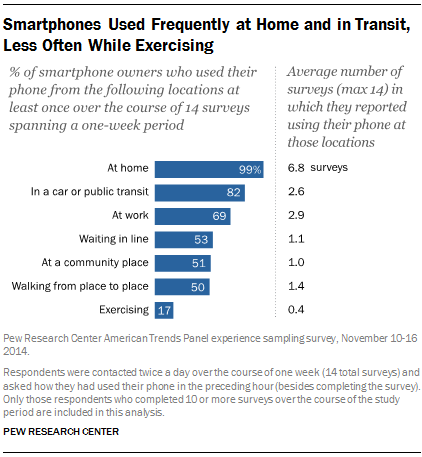 Smartphone owners used their phones in a wide range of locations during the experience sampling survey, but home was by far the most common — 99% of smartphone owners in this study used their phone at home at least once during the previous hour over the course of the study period, reporting that they did so in an average of 6.8 surveys over the week. Many smartphone owners use their phones while in a car or on public transit (82% indicated having done so at least once), and usage at work is also common (69% used their phone at work at least once). Notably, not all the study participants are employed full-time — among those who are, fully 91% used their smartphone at work over the study period, reporting doing so in an average of 4.3 separate surveys. Home usage is ubiquitous among smartphone owners both young and old, and smartphone owners ages 18-29 and those 50 and older are similarly prone to using their phones while in a car or on public transit (85% of younger users and 79% of older users did so), as well as in a community place like a park or coffee shop (49% of both younger and older smartphone owners used their phone in this type of location over the course of the study period). However, younger adults are substantially more likely to use their smartphone while walking from place to place. Almost two-thirds of 18-29 year olds (64%) did this at least once during the week-long study period, compared with 48% of smartphone owners ages 30-49 and 37% of those 65 and older. Smartphone owners ages 18-29 are also a bit more likely than those 50 and older to use their phone while waiting in line (55% vs. 43%) and while exercising (21% vs. 11%). Coordinating with others – 80% of smartphone owners reported using their phone to help coordinate meeting with someone at least once over the course of the study period, reporting that they did so in an average of 2.6 surveys. 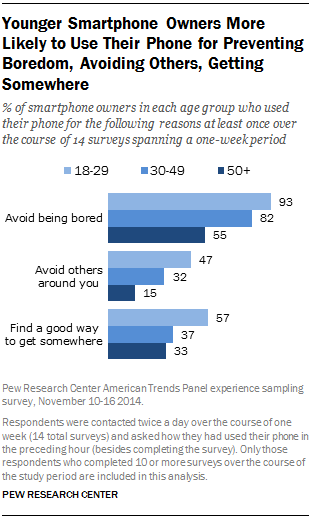 Avoiding boredom – 77% of smartphone owners reported that they turned to their phone to avoid being bored, reporting that they did so in an average of 3.5 surveys. Reminders and life logistics – 74% of smartphone owners used their phone at least once to help remember something they needed to do (in an average of 2.4 different surveys). Other problem-solving behaviors are somewhat less prevalent. Just over half of smartphone owners in this study (55%) used their phone at least once to learn about an important news development, and a similar number (53%) used their phone to resolve an issue or settle an argument. Some 42% used their phone at least once to find a good way to get somewhere they needed to go, and almost one-in-three (31%) used their phone to avoid having to deal with people around them. Younger users stand out especially prominently when it comes to using their phones for two purposes in particular: avoiding boredom, and avoiding people around them. Fully 93% of 18-29 year old smartphone owners used their phone at least once to avoid being bored, with respondents in this age group reporting doing so during the previous hour in an average of 5.4 surveys over the one-week study period. Similarly, 47% of young smartphone owners used their phone to avoid interacting with the people around them at least once during the study period, roughly three times the proportion of older smartphone owners who did so. Younger users were also substantially more likely than older users to say that they had used their phone to help them find a good way to get somewhere—57% did so. At the same time, certain types of information are equally common among younger and older users. There are few age-related differences when it comes to using one’s phone to resolve or settle an argument, learn about a news development, coordinate with meeting someone, or be reminded of a task or appointment. 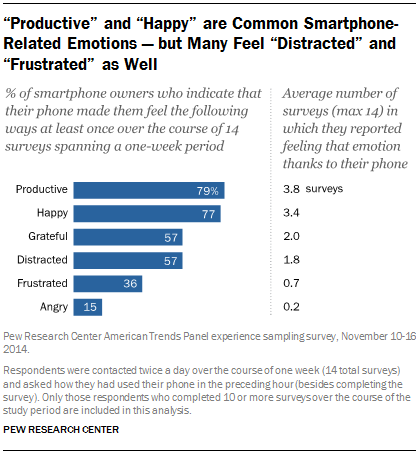 When it comes to the emotions that people experience as a result of their smartphones, “productive” and “happy” lead the way — 79% and 77% of smartphone owners, respectively, indicated that their phone made them feel this way at least once over the course of the study period. On average, users reported feeling “productive” in 3.8 surveys and “happy” in 3.4 surveys. At the other end of the spectrum, just 15% of smartphone owners indicated that their phone made them feel “angry” at any point during the course of the study. Feelings of smartphone-induced distraction are especially common among younger adults. Fully 73% of 18-29 year old smartphone owners indicated that their phone made them feel “distracted” during the study period, 11 percentage points higher than among those ages 30-49 and 41 percentage points higher than among those 50 and older. Younger users were also around three times as likely as those 50 and older to say that their phone made them angry at one point or another during this study (22% vs. 7%). At the same time, younger users are significantly more likely than those in other age groups to indicate that they experienced being happy or grateful as a result of their phone. Smartphone owners reported feeling “productive” thanks to their phones at high rates across a range of age groups — 78% of 18-29 year olds, 79% of 30-49 year olds, and 80% of those 50 and older reported that their smartphone made them feel this way.